The plan of Angkor Wat is difficult to grasp when walking through the monument because of the vastness. Its complexity and beauty both attract and distract one’s attention. From a distance Angkor Wat appears to be a colossal mass of stone on one level with a long causeway leading to the center but close up it is a series of elevated towers, covered galleries, chambers, porches and courtyards on different levels linked by stairways. Even though Angkor Wat is the most photographed Khmer monument, nothing approaches the actual experience of seeing this temple. Frank Vincent grasped this sensation over 100 years ago. The general appearance of the wonder of the temple is beautiful and romantic as well as impressive and grand it must be seen to be understood and appreciated. One can never look upon the ensemble of the vat without a thrill, a pause, a feeling of being caught up onto the heavens. Perhaps it is the most impressive sight in the world of edifices. Angkor Wat occupies a rectangular area of about 208 hectares (500 acres) defined by a laetrile wall. The first evidence of the site is a moat with a long sandstone causeway (length 250 meters, 820 feet; width 12 meters, 39 feet) crossing it and serving as the main access to the monument. The moat is 200 meters (656 feel) wide with a perimeter of 5.5 kilometers (3.4 miles). The west entrance begins with steps leading to a raised sandstone terrace in the shape of a cross at the foot of the long causeway. Giant stone lions on each side of the terrace guard the monument. Looking straight ahead, one can see at the end of the causeway the entry gate with three towers of varying heights and with collapsed upper portion. This entry tower hides the full view of the five towers of the central group. A long covered failure with square columns and a curved roof extends along the moat to the left and right of the entry tower. This is the majestic facade of Angkor Wat and a fine example of classical Khmer architecture. Helen Churchill candee must have been standing on this terrace almost 70 years ago when she wrote Any architect would thrill at the harmony of the fasade, an unbroken stretch of repeated pillars leading from the far angles of the structure to the central opening, which is dominated, by three imposing towers with broken summits. This facade originally had another row of pillars with a roof. Evidence of this remains in a series of round holes set in square based in front of the standing pillars. Tip Before proceeding along the causeway turns right, go down the steps of the terrace and walk along the path a few meters for a view of all five towers of Angkor Wat. Return to the center of the terrace and walk down the causeway towards the main part of the temple. The left-hand side of the causeway has more original sand stone than the right-hand side, which was restored by the French. In the 1920 when RJ Casey walked on this causeway he noted it was an oddity of engineering The slabs were cut in irregular shapes, which meant that each had to be chiseled to fit the one adjoining. The effect as seen under the noonday sun…is like that of a long strip of watered silk’10 On the left side just before the midway point in the causeway two large feet are carved in a block of sandstone. 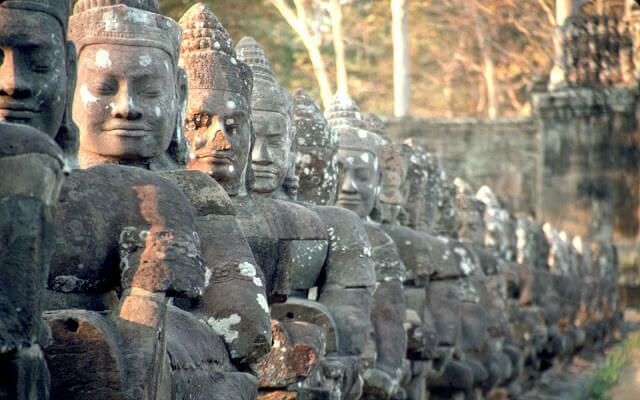 They belong to one of the figures at the entrances to Angkor Thom and were brought to Angkor Wat in this century the causeway was repaired with reused stones. The upper portions of the three sections on this tower-one each at the center and the two ends – have collapsed. The porches on each end of the gallery may have served as passages for elephants, horses and carts as they are on ground level. When Helen Churchill Candee saw these entrances in the 1920 she remarked that architecture made to fit the passage of elephants is an idea most inspiriting. A figure of a standing Visnu (eight arms) is in the right inside the entry tower. Traces of original color can be seen on the ceiling of the entry tower at the left. Continue westward along a second raised walkway (length 350 meters, 1,148 feet; width 9 meters, 30 feet). A low balustrade resembling the body of a serpent borders each side. Short columns support the balustrade. Looking west one sees the celebrate view of Angkor Wat that appears on the Cambodian flag. Standing at this point one teels compelled to get to the wondrous group of the five domes, companions of the sky, sisters of the clouds, and determine whether or not one lives in a world of reality or in a fantastic dream. Six pairs of ceremonial stairs with platforms on each side of the walkway lead to the courtyard. A continuation of the serpent balustrade along the walkway frames the stairs. This arrangement is sometimes called a landing platform. The balustrade terminates with the body of the serpent making a turn at right angles towards the sky and gracefully spreading its nine heads to from the shape of a fan. Two buildings, so-called libraries stand in the courtyard on the left and right, just past the middle of the causeway. These ‘jewel-boxes Khmer art ‘are perfectly formed. A large central area, four porches, columns and steps present a symmetrical plan in the shape of a cross. Some of the columns have been replaced with cement copies for support. An original pillar lies on the ground before the library on the left. In front of the libraries are two basins (length 65 meters, 213 feet, width 50 meters, 164 feet) the one on the left is filled with water whereas the other lone is usually dry. Tip Turn left at the first steps after the library and before the basin and follow the path for about 40 meters (131 feet) to a large tree for a superb view of the five towers of Angkor Wat, particularly at sunrise. The walkway leads to a terrace kin the shape of a cross, known as the Terrace of Honor, Just in front of the principal entry tower of Angkor Wat. Supporting columns and horizontal carved molding around the base accentuate the form of the terrace. Steps flanked by lions on pedestals are on three sides of the terrace. Ritual dances were performed here and it may have been where the king viewed processions and received foreign dignitaries. R Casey sensed such activity in the 1920s One cannot but feel that only a few hours ago it was palpitating with life. The torches were burning about the altars. Companies of priests were in the galleries chanting the rituals. Dancing girls were flitting up and down the steps… that was only an hour or two ago, monsieur….it cannot have been more.. From the top of the terrace there is a fine view of the gallery on the first level, known as the Gallery of Bas-reliefs (215 by 187 meters, 705 by 614 feet). The outer side, closest to the visitor, comprises a row of 60 columns whereas the inner side is a solid wall decorated with bas-reliefs. Tip: At this point the visitor has the choice of continuing straight to the central towers or turning right to see the Gallery of Bas-reliefs (see pages 96-108 for a description of the bas-reliefs). The unit providing a link between the first and second levels is the Cross-shaped Galleries. This unique architectural design consists of two covered galleries with square columns in the shape of a cross and a courtyard divided into four equal parts with paved basins and steps. The method used by the Khmers to form corbel arches is visible in the vaults. Several decorative features in these galleries stand out windows with balusters turned as if they were made of wood, rosettes on the vaults, a frieze of Apsaras under the cornices, and ascetics at the base of the columns. Tip: Some of the pillars in the galleries of this courtyard have inscriptions written in Sanskrit and Khmer. On either side of the courtyard there are two libraries of similar form but smaller than the ones along the entrance causeway The Gallery of 1,000 Buddha’s, on the right, once contained many images dating from the period when Angkor Wat was Backlist. Only a few of these figures remain today. The gallery on the left is the Hall of Echoes, so named because of its unusual acoustics. Tip: To hear the resonance in the Hall of Echoes walk to the end of the gallery, stand in the left-hand corner with your back to the wall, thump your chest and listen carefully. Those who want to visit the library should leave the door at the end of this gallery. There is a good view of the upper level of Angkor Wat from this library. Return to the center of the cross-shaped galleries and continue walking toward the central towers. Another set of stairs alerts one to the continuing ascent. The outer wall of the gallery of the second level, closest to the visitor, (100 by 115 meters, 328 by 377 feet), is solid and undecorated, probably to create an environment for meditation by the priests and the king. The starkness of the exterior of the second level gallery is offset by the decoration of the interior. Over 1,500 Apsaras (celestial dancers) line the walls of the gallery offering endless visual and spiritual enchantment. These graceful and beautiful females delight all visitors. They were crated by the Churning of the Ocean of Milk. When one first walks into the courtyard the multitude of female figures on the walls and in the niches may seem repetitive but as one moves closer and looks carefully one sees that every one of these celestial nymphs is different, the elaborate coiffures, headdresses and jewellery befit, yet never overpower, these ‘ethereal inhabitants of the heavens’ Apsaras appear at Angkor Wat for the first time in twos and threes. These groups break with the traditional of decoration kin other part of the temple by standing with arms linked in coquettish postures and always in frontal view except for the feet, which appear in profile. Pang, a Cambodian poet, in a tribute to the Khmer ideal of female beauty wrote of the Apsaras in the seventeenth century. These millions of gracious figures, filling you with such emotion that the eye is never wearied, the soul is renewed, and the heart sated! They were never carved by the hands of men! They were created by the gods living, lovely, breathing women! Only the king and the high priest were allowed on the upper or third level of Angkor Wat, it lacks the stately covered galleries of the other two but is the base of the five central towers, one of which contains the most sacred image of the temple. The square base (60 meters, 197 feet long) of the upper level is 13 meters (43 feet) high and raises over 40 meters (131 feet) above the second level. Twelve sets of stairs with 40 steps each one in the center of each side and two at the corners-ascend at a 70-degree angle giving access to this level. Tip: The stairway to the third level is less steep on the west (center) but those who suffer from vertigo should use the south stairway (center, which has concrete steps and a handrail. the steps on all sides are exceptionally narrow. the visitor should ascend and descend sideways. All the repetitive elements of the architectural composition of Angkor Wat appear on the upper level. The space is divided into a cross-shaped area defined with covered galleries and four paved courts. An entry tower with a porch and columns is at the top of each stairway. Passages supported on both sides with double rows of columns link the entry tower to the central structure. The corners of the upper level are dominated by the four towers. Steps both separate and link the different parts. A narrow covered gallery with a double row of pillars and windows and balusters on the outer side surrounds the third level. The Central sanctuary rises on a tiered base 42 meters (137 feet) above the upper level. The highest of the five towers, it is equal in height to the cathedral of Notre Dame in Paris. This central sanctuary sheltered the sacred image of the temple. It originally had four porches opening to the cardinal directions. The central core was walled up some time after the sacking of Angkor in the middle if the fifteenth century. Nearly 500 years later French archaeologists discovered a vertical shaft 27 meters (89 feet) below the surface in the center of the upper level with a hoard of gold objects at the base. At the summit the layout of Angkor Wat reveals itself at last. The view is a spectacle of beauty befitting the Khmer’s architectural genius for creating harmonious proportions. Tip: Walk all the way around the outer gallery of the upper level to enjoy the view of the surrounding countryside, the causeway in the west and the central group of towers. You have not quite an aerial view the Phnom is not high enough for that …But you can see enough to realize something of the superb audacity of the architects who dared to embark upon a single plan measuring nearly a mile square. Your point of view is diagonal, across the north-west corner of the moat to the soaring lotus-tip of the central sanctuary, you can trace the perfect balance of every faultless line, Worshipful for its beauty bewildering in its stupendous size, there is no other point from which the Wat appears so inconceivable an undertaking to have been attempted-much less achieved by human brains and hands. By their beauty they first attract, by their strangeness they hold attention, Helen Churchill Candee wrote of the bas-reliefs in the 1920 .The Gallery of Bas-reliefs, surrounding the first level of Angkor Wat, contains 1,200 square meters (12,917 square feet) of sandstone carvings. The relief covers most of the inner wall of all four sides of the gallery and extend for two meters (seven feet) from top to bottom. The detail, quality composition and execution give them an unequalled status in world art. Columns along the outer wall of the gallery create an intriguing interplay of light and shadow on the relief. The effect is one of textured wallpaper that looks like the work of painters rather than sculptors’ The bas-reliefs are of dazzling rich decoration-always kept in check, never allowed to run unbridled over wall and ceiling possess strength and repose, imagination and power of fantasy, wherever one looks [the] main effect is one of “supreme dignity “wrote a visitor 50 years ago. The bas-reliefs are divided into eight sections, two on each wall of the square gallery each section depicts a specific theme. In addition the two pavilions at the corners of the west Gallery have a variety of scenes. The book does not include description of badly damaged relief. Some others are unidentifiable .The composition of the relief can be divided into two types scenes without any attempt to contain or separate the contents and scenes contain or separate the contents; and scenes contained in panels which are some-times superimposed on one another-this type is probably later. The panels run horizontally along the wall and generally consist of two or three parts. Sometimes the borders at the top bottom are also decorated. Themes for the bas-reliefs derive from two main sources-Indian epics and sacred books and warfare of the Angkor Period. Some scholars suggest that the placement of a relief has a relevance to its theme. The relief on the east and west walls, for example, depict themes related to the rising and setting sun. The word bas means low or shallow and refers to the degree of projection of the relief. The method of creating relief at Angkor Wat was generally to carve away the background leaving the design in relief. Sometime, though the method was reversed giving a sunken appearance. of some of the relief have a polished appearance on the surface. There are two theories as to why this occurred. The position of the sheen and its occurrence in important parts of the relief suggest it may have resulted from visitors rubbing their hands over them. Some art historians, though think it was the result of lacquer applied over the relief. Traces of gilt and paint, particularly black and red, can also be found on some of the relief’s. They are probably the remains of an undercoat or a fixative. Several primitive artistic conventions are seen in the bas-reliefs. A river is represented by two parallel vertical lines with fish swimming between them. As in Egyptian art, a person’s rank is indicated by size. The higher the rank the larger the size. In battle scenes, broken shafts on the ceremonial umbrellas of a chief signify defeat. Perspective is shown by planes placed one above the other. The higher up the wall, the further away is the scene. Figures with legs far apart and knees flexed are in a flying posture. Those who like to linger in this wonderful gallery of bas-reliefs will always be made happy by new discoveries will return as other joys of Angkor will allow. Tip: As the bas-reliefs at Angkor Wat were designed for viewing from to lefts the visitor should, follow this convention for maximum appreciation. Enter at the west entrance, turn right into the gallery and continue walking counterclockwise. If you start from another point always keep the monument on your left. If one’s time at Angkor is limited, the following bas-recommended. Description of the bas-reliefs in this guidebook follows the normal route for viewing Angkor Wat. They begin in the middle of the West Gallery and continue counter clockwise. The other half of the West Gallery is at the end of the section. Identifying characteristics are in parenthesis and the locations of scenes on the bas-reliefs are in bold type. This battle scene is the main subject of the Hindu epic Mahabharata. It recalls the historic was wars in Kurukshetra, a province in India, and depicts the last battle between rival enemies who are cousins (see page 54 for a description of this legend). The armies of the Kauravas and the Pandavas march from opposite ends towards the center of the panel where they meet in combat. Headpieces differentiate the warriors of the two armies. The scene begins with infantry marching into battle and musicians playing a rhythmic cadence. The battlefield is the scene of hand-to-hand combat and many dead soldiers. Chief officers and generals (represented on a larger scale) oversee the battle in chariots and on elephants and horses. The scene builds up gradually and climaxes in a melée. Bisma (near the beginning of the pane), one of the heroes of the Mahabharata and commander of the Kauravas, pierced with arrow, is dying and his men surround him. Arjuna (holding a shield decorated with the face of the demon rahu) shoots an arrow at Krsna, his half-brother, and kills him. After death, Krisna (four arms) becomes the charioteer of Arjuna. Enter the pavilion and view the scenes facing you. Then continue clockwise around the pavilion. The bas-reliefs in this pavilion depict scenes from epic the Ramayana. B- Center, above the door: A god receiving offerings. G- Right: Ravana, disguised as a chameleon, presents himself at the palace of Indra. J- Right: Krisna lifts Mount Govardhana to shelter their shepherds and their herds from the storm ignited by the anger of Indra. This gallery depicts a splendid triumphal procession from a battle between the Khmers and their enemies. The relief’s show methods used in warfare, mainly hand-to-hand combat, as they no machinery and no knowledge of firearms. The naturalistic depiction of trees and animals in the background of this panel is unusual. The central figure of this gallery is King Suryavarman II, the builder of Angkor Wat, who appears twice. An inscription on the panel identifies him by his posthumous name, suggesting it may have been done after his death. The rectangular holes randomly cut n this gallery may have contained precious objects of the temple. On the upper tier the king (seated with traces of gilt on his body) holds an audience on a mountain. Below of the place walk down a mountain in the forest. The army gathers for inspection and the commander mounted on elephants join their troops who are marching towards the enemy. The commander’s rank is identified by a small inscription near the figure. King Suryavarman II stands on an elephant (conical headdress, sword with the blade across his shoulder) and servants around him hold 15 ceremonial umbrellas. Visnu stands on a Garuda on a Garuda on a flagpole in front of the king’s elephant. The lively and loud procession of the Sacred Fire (carried in an ark) follows with standard bearers, musicians and jesters. Brahmans chant to the accompaniment of cymbals. The royal sacrifice in a palanquin. Towards the end of the panel: The military procession resumes with a troop of Thai soldiers (pleated skirts with floral pattern; belts with long pendants; plaited hair; headdresses with plumes; short moustaches) led by their commander who is mounted on an elephant. The Thai troops were probably either mercenaries of a contingent from the province of Louvo (today called Lopburi) conscripted to the Khmer army. A number of the Khmer warriors wear helmets with horns of animal heads (deer, horse, bird) and some of their shields are embellished with monsters for the same purpose. Three tiers recount the judgment of mankind by Yama and two tiers depict Heaven and Hell. Inscriptions have identified 37 heavens where one sees leisurely pursuits in palaces and 32 hells with scenes of punishment and suffering. Draperies and Apsaras separate the two and a row of Garudas borders the tier in the bottom. The roof was destroyed by lightning in 1947 and subsequently the ceiling of this gallery was restored by the French. Traces of gilt can be on riders on horses at the beginning of the panel. The lower section of the panel was badly damaged and liter filled with cement. Lower tier: Yama, the Supreme Judge (multiple arms, wields a staff and rides a buffalo), points out to his scribes the upper road representing heaven and the lower one of hell. Departed spirits a wait judgment. Assistants to Yama shove the wicked through a trap door to the lower regions where torturers deliver punishments such as sawing a body in half for those who overeat. Lawbreakers have their bones broken. Some of the punished wear iron shackles or have nails pierced through their heads. Upper tier: A celestial palace is supported by a frieze of Garudas with Apsaras in the skies. This is the most famous panel of bas-reliefs at Angkor Wat and derives from the Indian epic Bagavata-Pourana. The Ocean of Milk is churned by gods and demons to generate Amrta, the elixir of life. the purpose of the churning is to recover lost treasures such as the sourer of immortality, Laksmi the goddess of good fortune, the milk white elephant of Indra, and the nymph of loveliness. The retrieval of these objects symbolizes prosperity. It takes place during the second ascent of Visnu, when he is incarnated as a tortoise. The scene is decided into three tiers. The lower tier comprises various aquatic animals, real and mythical, and is bordered by a serpent. The middle tier has, on one side, a row of 92 demons (round bulging eyes, crested helmets) and, on the other side, a row of 88 gods (almond-shaped eyes, conical headdresses). They work together by holding and churning the serpent. Hanuman, the monkey god, assists. Visnu, in his reincarnation as a tortoise, offers the back of his shell as a base for the mountain Mandara, and as a pivot for the churning. He sits on the bottom of the Ocean. A huge cord in the form of the body of the serpent Vasuki acts as a stirring instrument to churn the sea. To begin the motion the gods and demons twist the serpent’s body; the demons hold the head and the gods hold the tail of the serpent. Then by pulling it rhythmically back and for th they cause the pivot to rotate and churn the water. The gods and demons are directed by three persons (identified by their larger size). Indra is on top of Visnu. On the extreme right Hanuman, ally of the gods, tickles the serpent. Upper tier: During the churning various female spirits emerge. Visnu appears in this scene again in yet another reincarnation-as a human being-to preside over the “churning “which, according to legend, lasted more than 1,000 years. Numerous other beings are depicted such as the three-headed elephant mount of Indra, Apsaras and Laksmmi, the goddess of beauty. They churning provoke the serpent to vomit the mortal venom, which covers the waves. Afraid the venom may destroy the gods and demons, Brahma intervenes and requests Siva to devour and drink the venom, which will leave an indelible trace on Siva’s throat. He complies and, as a result, he Amtrak pours forth. The demon rush to capture all the liquid. Visnu hurries to the rescue and assumes yet another reincarnation in the form of Maya, a bewitching beauty, and is able to restore much of the coveted liquid. INSCRIPTION Just past the middle of the East Gallery there is an interesting inscription of the early eighteenth century when Angkor Wat was a Buddhist monastery. It tells of a provincial governor who built a small tomb where he deposited the bones of his wife and children. The structure is in poor condition but recognizable in its original location, directly in front of the inscription in the gallery. VICTORY OF VISNU OVER THE DEMONS The bas-reliefs in this section of the Wast Gallery and the south part of the North Gallery were probably completed at a later date, perhaps the fifteenth or sixteenth century. The stiffness of the figures and the cursory workmanship reveal this change. An army of demons marches towards the center of the panel. Center: Visnu (four arms) sits on the shoulders of a Garuda. A scene of carnage follows. Visnu slaughters the enemies on both sides and disperses the bodies. The leaders of the demons (mounted on animals or riding or riding in chariots drawn by monsters) are surrounded by marching soldiers. Another group of warriors (bows and arrows) with their chiefs (in chariest of mounted on huge peacocks) follows. At the beginning of the panel Visnu in his incarnation as Krsna (framed by two heroes) sits on the shoulders of a Gruda. Agni, the god of Fire (multiple arms), sits on a rhinoceros behind him. This scene appears several times. A wall surrounding the city is on fire and prevents the advance of Krsna (mounted of a Garuda) and his army of gods. This Krsna scene also appears several times in the panel. The Garuda extinguishes the fire with water from the sacred river Ganges. The demon Bana (multiple arms, mounted on a rhinoceros) approaches from the opposite direction. Extreme right: Krsna (1,000 heads, hands across his chest) kneels in front of Siva who sits enthroned on Mount Kailasa with his wife Parvati and their son ganesa (head of an elephant) as they demand that Siva spare the life of Bana. A procession of 21 gods of the Brahmanic pantheon march in procession carrying classic attributes and riding traditional mounts. One-god battles against a demon while warriors on both sides battle in the background. A series of adversaries follow, the Kubera, God of riches (with bow and arrow), Appears on the shoulders of a Yaksa; followed by Skanda, Goe of war (multiple heads and arms), mounded on a peacock; Indra stands on his mount the elephant; Visnu (four arms) sits on his mount, a Guard; a demon (tiered heads) shaking swords; Yama, God of Death and. Justice (sword and shield), stands in a chariot pulled by horses; and Varian, God of the Water, stands on a five-headed serpent harnessed like a beast of burden. F- Left: A conversation between Sita and Hanuman in the forest; Hanuman gives Rama’s ring to Sota. SOUTH G- Right Visni (seated, four arms) surrounded by Apsaras. I- Left: Rama wins an archery competition; Rama and Sita sitting together. EAST J- Right: Visnu (four arms) on a Garuda; Krsna (mounted on a Garuda) bring back Mount Maniparvata which he took from a demon he killed; his army carries the remains of the demon. K- Center, above the door: Discussions on an alliance. Right: Suryva, the monkey king L- Left: Visnu reclines on the serpent Anent. This scene from the Ramayana is a long and fierce struggle between Rama and the demon king Ravana (10 heads and 20 arms), near the center. It is among the finest of the bas-reliefs at Angkor Wat. The battle takes place in Lanka (Sri Lanka) and ends with the defeat of Ravana, captor of Sita, the beautiful wife of Rama. The central figures are the monkey warriors who fight against the raksasas on Rama’s side. The brutality of war is juxtaposed with a graceful rendition of lithesome monkeys. Past the center: Rama stands on the shoulders of Sugriva surrounded by arrows; Laksmana, his brother, and an old demon, stand by Rama. Nearby, the demon king Ravana (10 heads and 20 arms) rides in a chariot drawn by mythical lions. Further on, Nala, the monkey who built Rama’s bridge to Lanka, is between them leaning on the heads of two lions. He throws the body of one he has just beaten over his shoulder. A monkey prince tears out the tusk of an elephant, which is capped with a three-pointed headdress and throws him and the demon to the ground.